All of our aluminum options are powdered coated, and typically come with lifetime warranties against corrosion and coating failure. We offer ornamental aluminum fencing and gates in several configurations, heights and colors. Post, gate, and picket sizes may vary according to their application. Gates are available in swing and slide options. 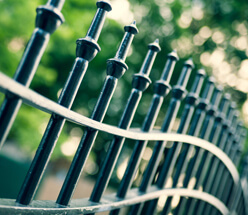 All ornamental steel fencing and gates are powdered coated over a galvanized steel substrate. Warranties are typically for 15 years against corrosion and failure of the coating. 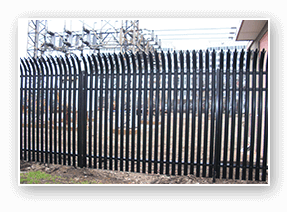 All of our ornamental steel fences are available in many different heights and configurations. We can customize post size, picket size and spacing, gates, and ornamental tops according to the tastes of the customer. Both swing and slide gates are available to match the fence design. Fence sections are typically 8 feet long. Posts are set in concrete. Fence panel attachments include security fasteners that cannot be removed. Our typical colors are black and bronze, however other colors are available upon request. Click here for ornamental steel style and color options. Choose Hohulin for Your Ornamental Fencing! 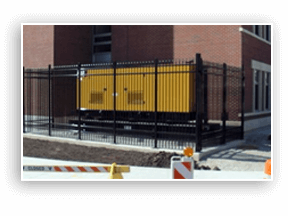 And for related commercial products, see our pages on Commercial Kennels, Highway Guard Rails, Commercial Gates & Operators and Commercial Railings.